Those damn cute kids at Supertart.com have done it again. They’ve launched a social network, and now they’re dipping into the Author Scoreboard market, I suppose. These are, yes it’s true, my current stats, with regards to queries sent out, responses I’ve received, and responses I haven’t received. 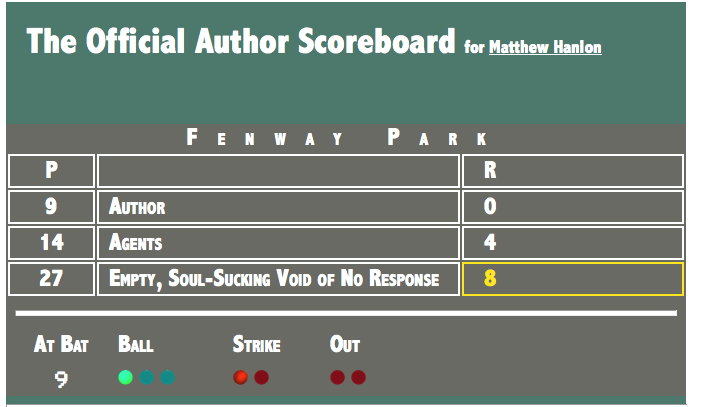 I’m not quite sure how it works that I’m the one at bat but the Empty, Soul-Sucking Void of No Response is scoring all the runs, but this isn’t baseball, and there is crying in pitching to agents and publishers, so there you go. All I’m aiming for is one run. Just one little run.